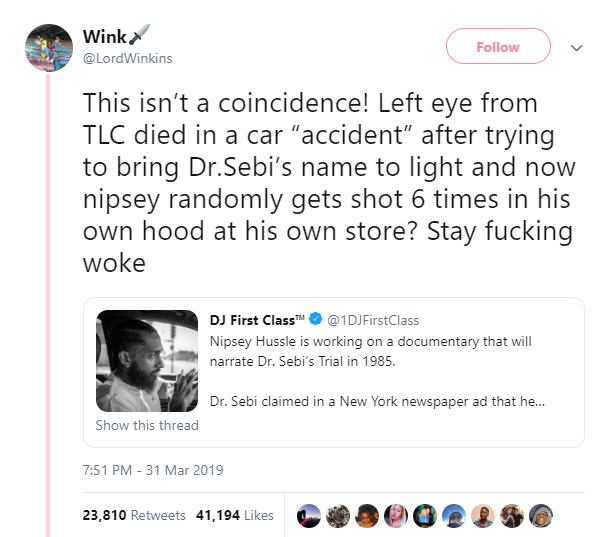 Nipsey Hustle’s Death, and a prediction last month that he might die, has Dr. Sebi also trending on Twitter. Twitter currently has Dr. Sebi trending. 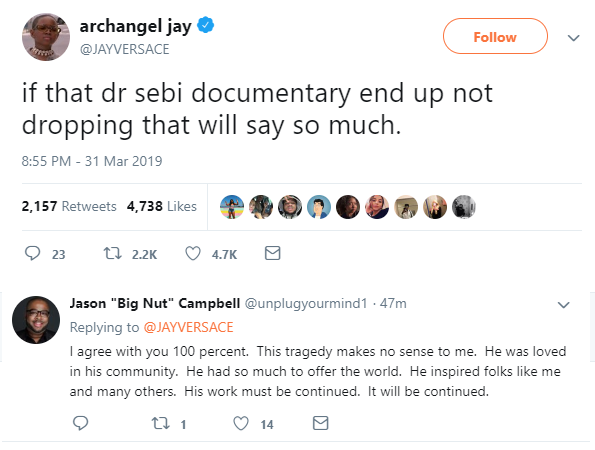 They’re speaking about how Nipsey Hustle, who just passed away today, was creating a documentary for Dr.Sebi that was soon going to be released, claiming that Dr.Sebi had cures for Aids, Cancer, Sickle Cell and more, and won his cases against the state of New York and Federal Courts. 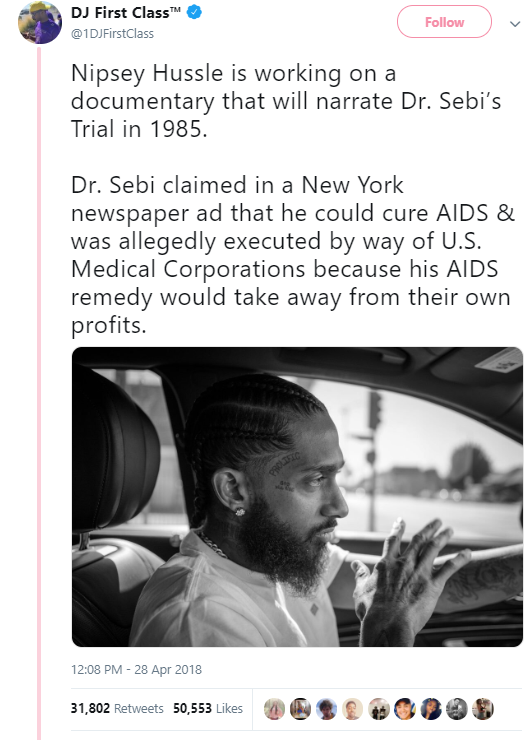 He was claiming that Dr. Sebi was allegedly executed by way of U.S. Medical Corporations because his AIDS remedy would take away from their own profits. Last month someone made a prediction Nipsey Hustle might die because of this documentary. Dr. Sebi and Nipsey Hustle are now trending on twitter. Twitter currently has Dr.Sebi trending, saying that Nipsey Hustle announced last year that he was going to start working on a documentary about Dr. Sebi. They’re saying that his death is too much of a coincidence for it to just have been a random murder of someone so specific. 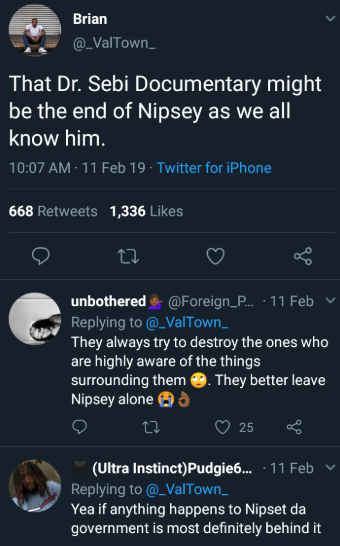 A post that was made last month in 2019, was speaking about how Nipsey was soon going to drop a documentary about Dr. Sebi, and that working on the documentary might be the cause of his death. On May 28, 2016, Dr. Sebi was arrested in Honduras at Juan Manuel Galvez International Airport for carrying some $37,000 in cash. He was released pending a court hearing, only to be rearrested June 3 by the Ministerio Público, Honduras’ version of the FBI, and charged with money laundering. Dr. Sebi remained in custody until Aug. 6, when he was rushed to a local hospital reportedly suffering from complications of pneumonia. 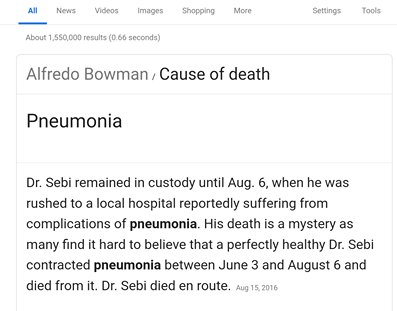 His death is a mystery as many find it hard to believe that a perfectly healthy Dr. Sebi contracted pneumonia between June 3 and August 6 and died from it. Dr. Sebi died en route. His death is a mystery as many find it hard to believe that a perfectly healthy Dr. Sebi contracted pneumonia between June 3 and August 6 and died from it. He was 82. Nipsey Hussle was killed in a shooting outside his clothing store in Los Angeles on Sunday afternoon.